Whoever invented this game is a genius. 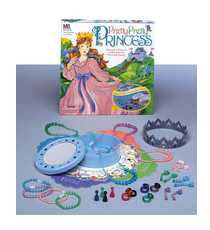 A game in which little girls win jewelry and the winner is crowned the Pretty, Pretty Princess? Absolute genius. Dora has all the jewelry because she was the only one playing. She won, which is the way she likes it. :0) Don't let the "cute" fool you; this kid really plays to win, which can be tough when there are 7 older people in the house!